Add this vanity to your bathroom for more traditional style in your home. Made with a special white solid wood base and a beige tan marble counter, this piece will make your bathroom look even nicer. It comes with a double-door cabinet and drawers for even more room to keep items. Bring a classic look and feel to your bathroom with this beautiful set from Wyndham Collection. Use this vanity to bring more traditional style into your bathroom. Made with a special white solid wood base and a beige tan marble counter, this piece will make your bathroom look even nicer. With a single-door cabinet and drawer, this vanity can hold all kinds of bathroom items. This simple vanity set from Wyndham Collection will fit right into any bathroom decor. Designed with a traditional style and strong build, this vanity is a perfect choice for any bathroom. Its beige tan marble counter and white solid wood base are very easy on the eyes. With a double-door cabinet and drawers, this vanity can hold all kinds of bathroom items. Make your bathroom look like new with this good-looking, useful set from Wyndham Collection. Bring a fresh, traditional look into your bathroom with this vanity. This piece comes with a beautiful white solid wood base and a beige tan marble counter. Made with a roomy double-door cabinet and drawers, this vanity has lots of room to keep items like toothpaste, towels, and hair brushes. Make your bathroom look like new with this good-looking, useful set from Wyndham Collection. For a bit of traditional style in your bathroom, choose this beautiful vanity. The beige tan marble counter and white solid wood base make a beautiful look in your bathroom. The simple look of the double-door cabinet and drawers is useful and classic. Put a nice twist on your bathroom project with this classic piece from Wyndham Collection. 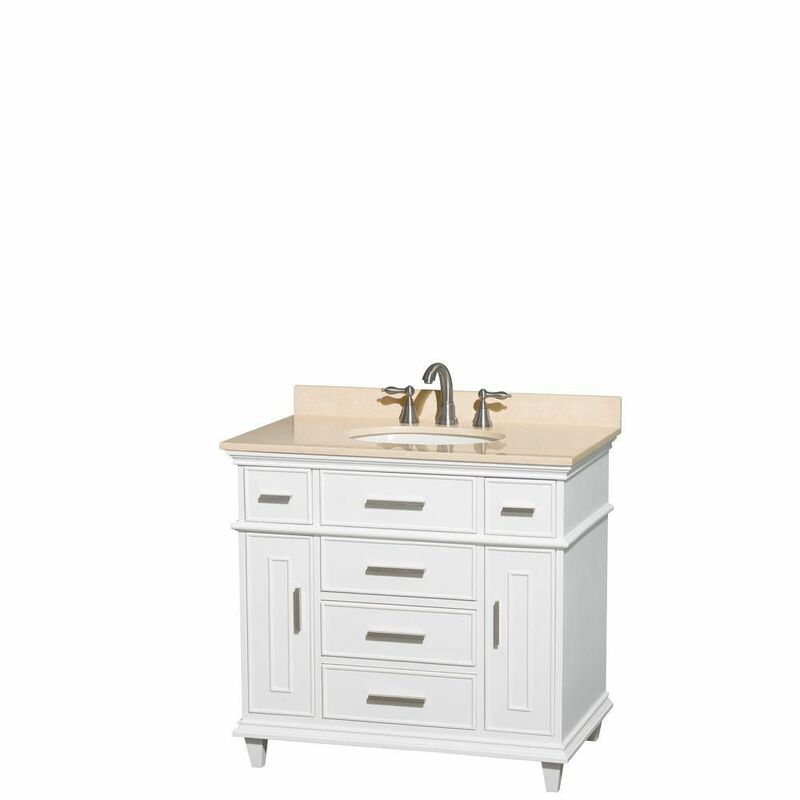 Berkeley 36-inch W 5-Drawer 2-Door Freestanding Vanity in White With Marble Top in Beige Tan Add this vanity to your bathroom for more traditional style in your home. Made with a special white solid wood base and a beige tan marble counter, this piece will make your bathroom look even nicer. It comes with a double-door cabinet and drawers for even more room to keep items. Bring a classic look and feel to your bathroom with this beautiful set from Wyndham Collection.